Many offices utilize panorex images to check for 3rd molars, abscesses, and as a general screening. There are advantages and disadvantages of panorex images compared to an FMX series. 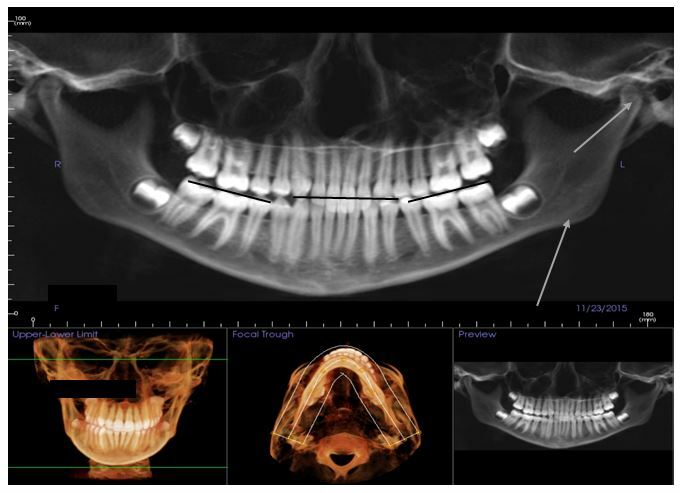 Panorex images allow a broad, general dental screening. With some training, they can also detect TMJ pathology, upper cervical spine problems (neck problems) and sinus pathology. Having looked at hundreds of CBCT images, plain film tomography of TMJ’s, and MRI’s; I’m able to detect questionable areas on panoramic images suggesting further investigation. Let’s look at some of the most common findings warranting further evaluation. Antegonial Notching: This is often seen in clenchers, bruxers, and TMJ patients. The masseter muscle (cheek) attaches to the lower jaw along the length of the lower jaw (except at the gonial angle of the mandible, hence the name antegonial meaning before, or ahead of the gonial angle. If you see AGN (antegonial notching), it is suggestive of sustained (long term) masseter muscle tension. This is typically from clenching, bruxing or a dislocated TMJ disc on that side of the mandible. In younger patients, it is often associated with airway-distorted growth of the facial skeleton. A video animation of growth and development can be viewed on the video below0. Intra-oral findings on the dentition will be bicuspid drop-off and is often associated to Antegonial Notching. Antegonial Notching suggests clenching, TMJ problems (dislocated disc most commonly). It may also be the sign that the facial growth was distorted by early childhood breathing problems (allergies, large tonsils). The right side here has a more notched area of bone reaction suggesting different muscle forces on that side. A later topic, but evident here is the moderate osteoarthritis in the patients left condyle (arrow points to it). The flat area and “point” are diagnostic of advanced joint problems. Mild antegonial notching with “irregular or bumpy” gonial angles. The top arrows at the TMJ point to the TMJ’s. Additional imaging showed moderate osteoarthritis in the left TMJ and advanced degenerative disease in the right TMJ condyle (difficult to see here). How do you address sightings of these anatomic irregularities? These findings prompt me to point it out to the patient and list some of the common things that contribute to it and why (as mentioned above). Often, patients will reveal symptoms such as “yes my jaw sometimes hurts” or “yes, I wake up with a sore jaw”, “my neck hurts in the morning”, “my jaw gets stuck sometimes”, etc. Measuring the jaw Range of Motion is a good way to provide feedback to patients. Clicking, popping or limited movement of the TMJ’s indicates disease. Painful muscles (to examination/palpation) indicate the damage is more than the body can tolerate and treatment might be suggested. A variety of occlusal problems can also be seen with AGN such as anterior tooth wear, abfractions, canine cusp tip wear, etc. This finding is most often associated with distorted facial growth from airway problems in the first 10 years of growth. Allergies, enlarged tonsils and adenoids, etc. This can be seen on a panorex image, but is also quite easily seen intraorally. Patients with significant bicuspid drop off will often have lower incisal wear, upper anterior incisal edge wear and scalloped tongues. Children typically have “tense tongues” or a heightened gag reflex with distortions such as this. There can be “functional problems” associated with uneven jaw growth such as TMJ disorders, parafunction, headaches, and sleep breathing problems. 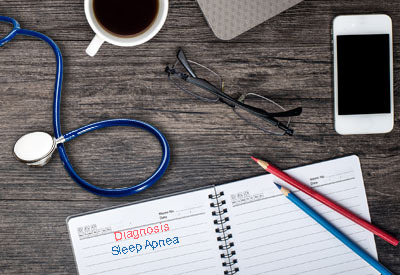 The potential for TMJ problems and Sleep Breathing Disorders (sleep apnea, snoring) is what you should think of when you see a deep overbite (which is what the bicuspid drop-off contributes to). ROM (range of motion), palpate for clicking/popping or other TMJ sounds or pain. The center black line shows the incisal edges of the lower anterior 6 teeth. You can see the molar and premolar teeth haven’t erupted as far (the “bicuspid drop off”). In panorex images that have an anterior bite tab for patients, this “drop off” to the bicuspid and molar cusps is more easily seen. The (lower) gray arrow points to the early antegonial notching on the patients left side. The upper left gray arrow shows the TMJ abnormally positioned in the fossa. This teenage girl has been in TMJ treatment for a couple years as we manage joint growth, position. She is now in orthodontics. Panoramic or clinical findings of Antegonial Notching and Bicuspid Drop-Off (both are clinical findings too) should prompt some additional questions and perhaps screening for TMJ disorders or Sleep Apnea.